I started a new scarf last night. It’s not that I don’t have any knitting going on, but that this skein of yarn has been calling to me. 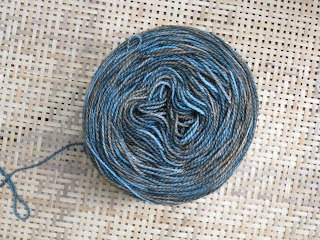 It’s Sundara’s Aqua over Terracotta sock yarn, given to me by my friend Kris. He had an extra. It sat at the corner of my desk for a few weeks, where I could keep an eye on it. Finally, the right pattern came along — Anne Hanson’s lovely Rivolo scarf. I think this is one of Sundara’s most beautiful colors, and of course I’m incapable of capturing it. When she dyes a color and names it Something Over Something, I pay attention. I do have a lot of her yarn in my stash, but I don’t hold on to it just because it’s precious. I knit with it, as often as possible. I just don’t understand the current (Ravelry-fueled) atmosphere of stalking and hoarding and collecting, of complaining about her update process or her website, of being jealous of people who purchase any, let alone enough for a project… it’s just yarn. Beautiful yarn, often stunningly so, but still just yarn. It’s meant to be used. Moving on now… Radiation treatments continue, and so does the plain pair of socks that have accompanied me on most of my medical adventures this summer. I’m at the heel of the second sock, so one of these days I’ll be done. With the socks and the medical adventures. This particular adventure — radiation — is not all that hard to tolerate, but I am worn out. Fatigued. I have fatigue the way you have a cold, or a sprain, or some other condition. It’s real (I always thought of it as something I had to power through), and it’s not like being tired or sleepy. It’s as if I can go forward, but only on low speed. Strange, but annoying. The other side effects are just plain annoying. I’m getting lots of rest and eating really good food (protein! fruit & veggies! water! ), and that helps. I’m also going to work for a few hours each day, which is good for my spirits. I’m just bobbing along with the current. In a few weeks it will be time to start chemo, which will put other stresses on my system, but I’ll be ready. Bit by bit, row by row, I’m getting there. I can’t see the other shore just yet, but I know it’s there! Indeed, a beautiful scarf pattern for the beautiful yarn! Your spirit through this season of your life continues to amaze me Jane! Continuing to keep you in my thoughts & prayers! I’m glad you’re able to get to work a few hours a day. It’s nice to have a feeling of normalcy. The yarn and the scarf are beautiful! Keep taking good care of yourself. It’s good to hear how well you’re doing. You sound happy, and that’s probably the best thing of all. A gorgeous project in the works can’t hurt! Such pretty yarn. Lots of good healing thoughts coming from me, too. 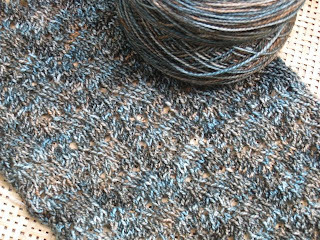 I hate to hear (read) the stress in Sundara’s posts about her yarn. She is trying to keep everyone happy, an impossible task. Thank you- you are the reason I found her beautiful yarn, I just completed a swallowtail shawl with her silky merino and it turned out wonderfully.Don’t be too hard on yourself right now. If you’re tired, so be it, naps are included in the protocol. Remember, you have many of us sending you thoughts of lovingkindness, including me. The yarn is beautiful and yes I agree with you – it’s just yarn, for heaven’s sake!It’s like people who buy musical instruments as an investment, place them in a vault or something. Instruments were meant to be played!Glad you’re moving through this phase of your treatment with a relative amount of ease. I continue to send love and Reiki and healing vibrations in your direction.Thanks for the update. I’m always thinking of you, having you in my prayers.You’ve got the most beautiful yarns to work with. You have inspired me several times! You have a fantastic attitude Jane. It’s just like knitting an intricate sweater. It’s only knits and purls and if you take it row by row, day by day, you WILL get thru it. Love the scarf. Yarn that beautiful must have medicinal properties. Probably wouldn’t hurt to sleep with it, either. Jane, I have to apologize. I am so far behind on reading blogs that the word “radiation” took me completely by surprise. You seem to be handling things with grace, so I hope it all continues to go well. This will all be behind you soon enough.Enjoy the quieter-than-normal summer! What a beautiful yarn! And a fitting metaphor. Bobbing along is a good thing because none of the undertows can possibly reach you. I can’t keep up with all of Anne’s beautiful patterns! Holy moley! And with Sundara, it’s to the point where I’m ready to keep Sundara yarn out of my Ravelry stash just because I’m tired of random people trying to convince me to swap or sell. Stay strong! You’re wonderful! Beautiful yarn. Blues and browns together are my favorite combo. The pattern is so lovely. You make the most beautiful things it’s always a treat to see what you are making. You are always in my thoughts.